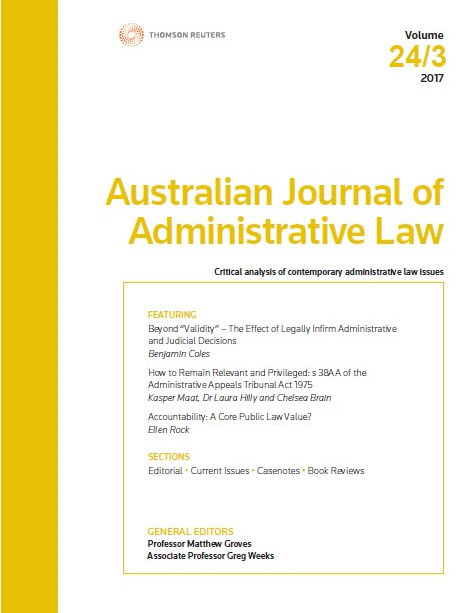 The latest issue of the Australian Journal of Administrative Law (Volume 24 Part 1) marks a new chapter for the Journal, as Dr Damien Cremean retires from his role as the General Editor of AJ Admin L after a very successful tenure spanning over a decade. He has also stepped down as General Editor of the Journal of Civil Litigation and Practice, which he originally founded in 2011. Dr Cremean is a Senior Member of the Administrative Appeals Tribunal, and continues to be active as The Australian Law Journal‘s Admiralty & Maritime Section Editor. He has held posts across numerous boards and committees including as former Deputy Chief Commissioner of the Victorian Building Authority, as Deputy President of the Victorian Civil and Administrative Tribunal, a part-time Deputy Registrar of the Federal Court of Australia, a Senior Law Reform Officer of the Australian Law Reform Commission, and as a Senior Member on government appeal boards and tribunals. As well as being a prolific author, Dr Cremean is an Adjunct Professor at the TC Beirne School of Law, University of Queensland, having also taught extensively at RMIT University, Melbourne University, Murdoch University and Deakin University, to name but a few. This impressive breadth and array of his experience bespeaks the deep knowledge of and passion for the law which he brings to his publications, and Thomson Reuters warmly thanks Dr Damien Cremean for all his contributions, as he hands over the reins to the new team of Editors. Dr Greg Weeks is a Senior Lecturer in the College of Law at the Australian National University, where he teaches Administrative Law and related courses. He was previously a member of the Faculty of Law at the University of New South Wales. Greg’s research interests are primarily related to judicial review and state liability and he has published a number of articles and book chapters in these fields. Greg has also served as the General Editor of the Australian Administrative Law Bulletin. Greg is one of the co-authors of Judicial Review of Administrative Action and Government Liability (Thomson Reuters, 6th ed, 2017). Professor Matthew Groves is Professor of Public Law at the Law School of La Trobe University. He teaches and researches public law, particularly administrative law. Prior to joining the La Trobe Law School, he was a professor in the Law Faculty of Monash University. Matthew has written and edited many books on administrative law and is a former member of the Administrative Review Council. Matthew is one of the key co-authors of the leading text, Judicial Review of Administrative Action and Government Liability (Thomson Reuters, 6th ed, 2017). As the incoming General Editors Professor Matthew Groves and Dr Greg Weeks have stated in their first Editorial for AJ Admin L, they have retained the Book Reviews and Case Notes, but have opted for a more open format on other sections by creating a single “Current Issues” section maintained by a panel of three administrative law practitioners, with a “roving brief” to publish notes on a wide range of issues of interest to the Journal’s readership. Nathalie Ng continues to provide her insightful summaries as the Casenotes Section Editor. Justin Davidson is a Senior Executive Lawyer at the Australian Government Solicitor (AGS). He regularly appears for Commonwealth and State authorities in administrative law and information protection disputes in courts and tribunals around Australia. He has a particular interest in freedom of information and privacy law and frequently delivers training to government officials on a range of administrative law topics. Justin previously managed the AJ Admin L’s section on Trade, Commerce and Revenue. Katie Miller is an LIV Accredited Specialist in Administrative Law and Executive Director, Legal Practice, Victoria Legal Aid. As a practising lawyer, Katie has advised, and conducted litigation on behalf of, state and federal governments in relation to administrative law, public sector governance and integrity. Katie writes, tweets and presents on issues relating to administrative law and how technology is challenging and disrupting the legal sector and traditional concepts of accountability in the public sector. You can follow Katie on Twitter at @natural_justice. Dr Stephen Tully is a barrister on the Sixth Floor of St James Hall Chambers in Sydney. He was previously a teacher of international law, a postdoctoral research fellow and a Commonwealth solicitor practising administrative and immigration law, and previously held the role of the Immigration and International Aspects Section Editor on this Journal. Stephen was educated at the University of New South Wales, Kings College, London and the London School of Economics and Political Science. Stephen is one of the co-authors of the highly respected Interpretation and Use of Legal Sources – The Laws of Australia (Thomson Reuters, 2013) and a regular updating author for The Laws of Australia encyclopedia. Stephen is also the author of the International Law Practice Manual (Thomson Reuters, 2015). Dr Janina Boughey is a lecturer in public law at the Faculty of Law, Monash University. Nina’s research focuses on the interaction between human rights and judicial review of administrative action, comparative administrative law, and the constitutional relationships between the executive and the other branches of government.